I was a market maker on the floor of the New York Stock Exchange when I learned about the pitfalls of behavioral biases. My job, by definition, was to “maintain a fair and orderly market in the products to which I was assigned.” This basically meant that I was to use my firm’s capital to buy when there were not enough buyers and to sell when there were not enough sellers in order to dampen volatility in the products that I was trading. I was the person who took the other side of the trade. This could be pretty harrowing in extreme one-way situations because you know that, unless you were on the right side of the trade before the move began, you were likely to lose a lot of money. The trade-off was that, under normal circumstances, where the product is not moving like a one-way train, I would be able to buy and sell throughout the day and usually turn a profit before going home flat . . . with no position. This was the preferred model. But in the summer of 2006, I decided that I was going to express a view. I was trading a product which is known as a trust, BP Prudhoe Bay (BPT). Big picture, the price at which this trust traded was determined by the price of oil because it paid a dividend based on the weighted average price of oil during the quarter. If oil was rising, so was this product, but if oil fell, BPT went along for the ride. Well, oil has been in a strong uptrend heading into that summer and BPT was trading higher in lock-step. What was also moving higher was my position in BPT. I maintained a long position by adding on every decline in price. Sounds good right, buy on the declines and sell on the rebounds, make a market? But, I would always sell less on the rebounds because I was convinced that prices would keep trending higher. In July, 2006, the price of oil and BPT stopped moving up and I began to lose money on my position. I was distraught, I would spend my nights searching for data points that proved that I was correct and that the market was wrong. Instead of managing risk and cutting my position, I kept adding on the way down until finally, my risk manager came over and made me cut my position, booking a large loss. 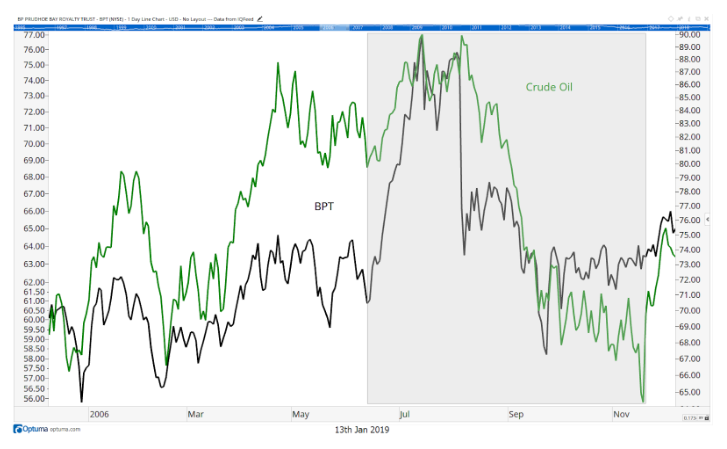 The shaded area of this chart highlights the time in question and you can clearly see the rise and fall of both Crude Oil and BPT. First and foremost, I broke the cardinal rule of not managing risk. Second, I deviated from a proven process in order to “take a shot” at a bigger payday. Finally, I compounded both of these errors by exhibiting behavioral biases which are known to be detrimental to traders and investors. Confirmation Bias is the tendency to search for, interpret, focus on and remember information in a way that confirms one’s preconceptions. This is exactly the behavioral bias I was doing when I went home every night to “find” the datapoint that proved that oil had to go higher. We do this when we own a stock which is going lower and we head over to Twitter or CNBC or any other source of information which we could use to convince ourselves that the position is going to be a winner. The best information source that I know of is price. If price moves against you and reaches your predetermined risk management level, get out. It is easier to reevaluate the situation from the sidelines than to carry the emotional baggage of having a position. If the opportunity presents itself, you can always get back in. If you have to search for data points that prove you are correct, you are likely already wrong. Anchoring is the tendency to rely too heavily, or “anchor,” on one trait or piece of information when making decisions. So, after going out to search far and wide for the one piece of information that supports our view, what do we do? We anchor to it. That’s right we hold it sacred as if it is the only thing that matters. Does this sound like a good strategy when dealing with a complex dynamic system such as the stock market? But it does not have to be a datapoint, it can also be the price you paid for an asset. “I paid $90 so that’s the price I want, I don’t care if the stock is trading at $70 now.” We have to be adaptive and open minded, and limit behavioral biases, when we are trading and investing. Endowment Effect is the tendency for people to demand much more to give up an object than they would be willing to pay to acquire it. Here is a cold hard truth, the market owes us nothing . . . nothing. Just because you bought a stock does not mean that it is instantly worth more than the price that you paid for it. It is worth exactly what the market will bare at any given moment in time. We tend to think that now that we own something, it is worth more. We hold out until someone is willing to pay our price. But think about how arrogant that is. The market is a complex system and is constantly processing new information. If that information leads investors to believe that prices should be lower, then it does not matter what you think your stock is worth. Think about it this way, would you pay the higher price for the stock? The answer is no, because you are actually interested in selling there. Loss Aversion is defined as the disutility that giving up an object is greater than the utility associated with acquiring it. What does that mean? In its basic form, it means that on average a loss makes us feel twice as a bad as a gain makes us feel good. In my opinion, it is part of the reason that one of the other behavioural biases, the Endowment Effect, exists . . . we hate to lose. In our brains, it is better not to lose $100 than it is to gain $100. This makes no sense. But, by being aware of it, we can adjust our behavior. How? In investing we can use stops or manage risk. This one is self explanatory but let’s dive in. The tendency to do (or believe) things because many other people do (or believe) the same. Call it group think, call it herd behavior, call it anything you want just be aware of it. Remember, “the market” will try to make a fool of the greatest number of people possible at any given time. If your process is to chase the latest fads in the market (if the media has a bug or widget on the screen tracking it, it is likely a fad) you are not likely to have long-term success. Did you chase crypto at the end of 2017 after hearing the amazing pitch from your millennial nephew at the Thanksgiving table? How about Tilray? Did you chase it at $300 over the summer? Warren Buffett is famous for saying “be fearful when other are greedy and greedy when others are fearful”. Warren has been doing this for a long time. Now that we know that these behavioral biases exist, what can we do? First, keep learning. Read as much as you can on behavioral biases so that you can recognise them in yourself. Start with the book Thinking, Fast and Slow by Daniel Kahneman. He won a Nobel Prize. Next, have a process which is proven and repeatable. At Chaikin Analytics we believe that fundamentals drive the market but emotions drive the market to extremes. 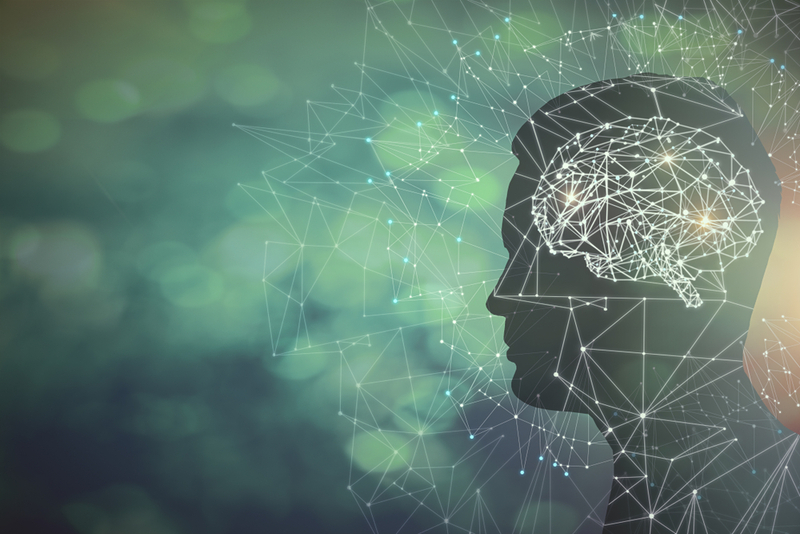 If you have a process or system which limits, or better yet eliminates, your emotions, you are more likely to mitigate these behavioral biases and have investment success. Finally, part of any process should be a system for managing risk. Since we hate losing more than we like winning, we should do our best to limit the size of the losses. Let us know how you manage your emotions and avoid behavioral biases while investing! Drop us a line in the comments.